December 29, 2011  The former Libyan leader's daughter Aisha has reportedly told friends she would feel safer there than anywhere else. For years, there have been rumors of Jewish roots in the Gadhafi family tree. It's not likely she'll be welcomed, though. December 28, 2011  Thousands protest in the city of Beit Shemesh against the imposition of a strict religious code favored by ultra-Orthodox Jews. It became a national issue after a young girl was spat on for her allegedly "immodest" attire. December 21, 2011  Robert Siegel speaks with Dennis Ross, counselor at the Washington Institute for Near East Policy. Ross recently left his post as special assistant to President Obama on Iran and the Middle East at the National Security Council. Ross' involvement with Middle East diplomacy dates back to the Reagan administration. They discuss Iran's nuclear program, the possibility of a U.S. military strike against Iran, and the prospects for Israeli-Palestinian peace. December 21, 2011  Violence in Syria between the government and the opposition continues to mount and expectations for a peaceful resolution are low. Turkey was once closely allied with the Syrian president, but now calls for him to step down. Ibrahim Kalin, chief adviser to Turkey's prime minister, explains his country's position on Syria and its role in the Middle East. December 12, 2011  The Israeli-Palestinian conflict invariably comes up in U.S. presidential politics. 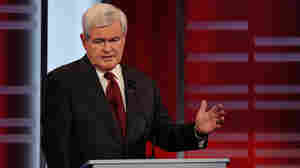 Now, Republican candidate Newt Gingrich has drawn the ire of Palestinians by calling them "an invented people." 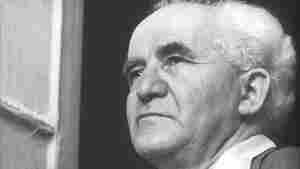 December 11, 2011  Israel's first prime minister, David Ben-Gurion is a mythic figure. In Ben-Gurion: A Political Life, Israeli President Shimon Peres talks about his mentor. December 8, 2011  The Republican candidates spoke to the national Republican Jewish Coalition Wednesday in Washington, D.C. They all showed support for Israel while slamming President Obama's Mideast policy. December 7, 2011  The GOP presidential contenders addressed the Republican Jewish Coalition Forum Wednesday. Lynn Neary talks to NPR's Ari Shapiro for more. November 30, 2011  British authorities have closed their embassy in Iran's capital city, Tehran, and recalled all diplomatic staff, a day after Iranian protesters stormed the embassy. Britain also said it was requiring Iran to close its embassy in London and recall all its staff in the next 48 hours. November 25, 2011  Rival Palestinian leaders met in Cairo this week to discuss prospects for a reconciled government. For more than four years, the Palestinian Authority has governed the West Bank, while the militant Islamist group, Hamas, has ruled the Gaza Strip. But any government that included Hamas would face serious obstacles. November 23, 2011  Guy Raz talks to Associated Press reporter Adam Goldman about the ongoing story of Hezbollah and the CIA spy network in Lebanon. November 23, 2011  Tuesday night's GOP presidential debate was hosted by CNN and two think tanks and was focused on foreign policy. Iran came up several times during the gathering. Is what the candidates said about Iran accurate? 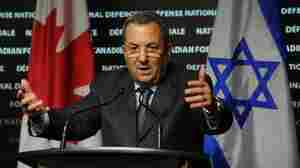 November 21, 2011  Israel's Defense Minister Ehud Barak says that Iran's nuclear program should be stopped.